29th August 2014. Father's Day Gift Ideas; New Recipes Competition (Dips & Condiments); National Gathering Raffle Tickets; Find 6000 campsites Australia-wide; National Gathering Supporters; Hakeas in Flower Now; New Shop Product - A Woman's Look at Camping Cook Book. Tip of the Week - Did you know that ExplorOz Places lists over 6000 campsites Australia wide? These camps are categorised by the red tent symbol for Camps with Fee, the green tent symbol for Free Camps, and a van symbol for Caravan Parks. Each Place location provides a GPS position, distances from nearest towns, icons showing the range of facilities, and a wealth of other information such as a description, address, phone, links, reviews and photos shared by other ExplorOz campers. For tips on how to find these listings, read this simple overview in Site Tips. 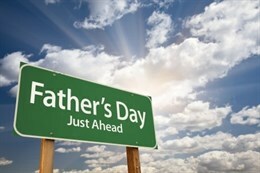 Father's Day - Father's Day is next Sunday 7th September but we've got you covered with a great range of gift ideas for the outdoor enthusiast Dad, whether he's a 4WDriver, caravanner, sportsman, or fisherman. To help you, we've created a special list of of Father's Day gift ideas here (including gift vouchers) but with over 700 products to choose from in the ExplorOz Shop, there's bound to be something for him that we can deliver to your door, or even direct to his door! Delicious Dips & Crafty Condiments - this month we're focussing on the tasty extra bits that transform a basic camp dinner into something special. Focussing on Dips, Sauces & Condiments that can be whipped up when travelling on the road to enhance your meals, we want you to post your ideas to the the Dips & Condiments category of ExplorOz Recipes. Over the next 4 weeks, all recipes submitted to this category will go in the draw to win a camp cooking double book prize-pack, valued at $69.90 thanks to Boiling Billy publications. (Winner announced edition 352). 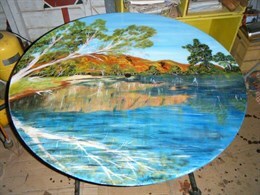 National Gathering Plans in Full Swing - Over 500 tickets have already been allocated to early-bird buyers in the National Gathering Raffle with many people showing keen interest in winning this beautiful and unique Australian artwork hand-painted in Chinchilla by Jan's Country Art. Our partners EFlare and Westprint have made very generous donations of products to help us raise funds at this year's ExplorOz National Gathering at Trilby Station. The donated items will be up for grabs at daily raffles and competitions at the Gathering, with all funds raised going to the RFDS Clinic in Louth NSW. If you are a Shop Supplier, or Business Member, and would like to donate products or vouchers for services, please refer to this past business newsletter (view online) for details on how to get involved. Bloomin' News - Now is a great time to see Hakeas out in often spectacular flower. 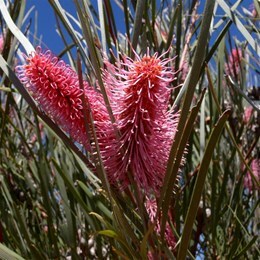 Hakeas are closely related to Grevilleas and the two can be hard to tell apart. The fruits or seed capsules can settle the matter though as Hakeas have large, thick, woody seed capsules, while those of Grevilleas are thin and papery. Some hakeas have brightly coloured flowers like the Grass leaved Hakea (Hakea francisiana) that is found throughout the Great Victoria Desert. There are several Hakeas posted in the Wildflowers section on ExplorOz. Can you add some more to the list? 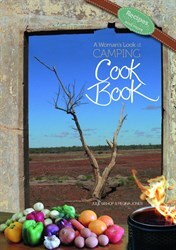 New Release - The A Woman's Look at Camping Cook Book includes recipes, hints, tips and more! Featuring spectacular landscape photography accompanied by happy hassle free recipes, you may open the book to read the recipes, but you will be drawn in by the pictorial natural wonders of Australia. There are hundreds of how-to techniques, Camp Oven and Dream Pot recipes, and kitchen essentials checklists. A must have, their new cook book has the WOW factor that makes a beautiful resource for home or camping.